ne of the downsides of extensively playing MMOs is that they’re such timesinks. Ideally, you could always be doing something in an MMO. I can say that playing WoW since 2005 definitely had a drastic impact on my time spent reading books. It is something I always regretted and yet never successfully battled. I have a lot of gadget loving friends. Nerds united, certainly. I think amongst my closest group of online friends, I might be the only one without a smartphone. But that’s mostly because in Germany I still find Internet plans too expensive to justify a smartphone of any kind. I work a job where I have full web access all day long, and I don’t need a smartphone for the 15 minute ride home. Anyway, my gadget loving friends, a lot of them own a Kindle and were raving about the amazing-ness of it all. It was a siren’s call, I had to have one as well. The downside of buying a Kindle in Germany is that you have to order it from the American Amazon site, and you can spend a long time looking for German titles. The German e-book market is very complicated, and you usually seem to buy PDFs protected by some form of DRM. German publishers are a complicated bunch, and thus there is no native German Kindle available and probably won’t be for some time. Lucky for me, my preference for SF&F means I read books by American and English authors, written in their native language. I despise German translations for many reasons, the biggest being that they slaughter the books and rip them into multiple books instead of a single volume. The perfect example is the Wheel of Time, currently sitting at book 13 in the original. In German they just released book 12, only that in German it’s actually book 33. THIRTYTHREE. Rip-off. For my birthday in February, my awesome co-workers collected money so I could buy a Kindle (and I got a new headset to boot, rar). I ordered it Sunday night, and Wednesday morning, my greedy hands received the small Amazon box from the UPS guy. I am still amazed at how fast it shipped. I have waited longer to get books shipped from Amazon in Germany. For me the Kindle is such a success story. I take it with me everywhere I go. Downtime at work? I read. Come home work, sit in the reclining chair and read. Doctor’s appointment? Screw the lame magazine selection, I bring my own reading. I love the sharpness of the e-ink, the reading comfort. I have read more since February than I have read in all of 2010. I love it so for reading, that I am always looking for other nifty things you can do with your Kindle. Get your own screensavers – Tired of looking at Emily Dickinson? Here’s a guide to set up your own screensavers. 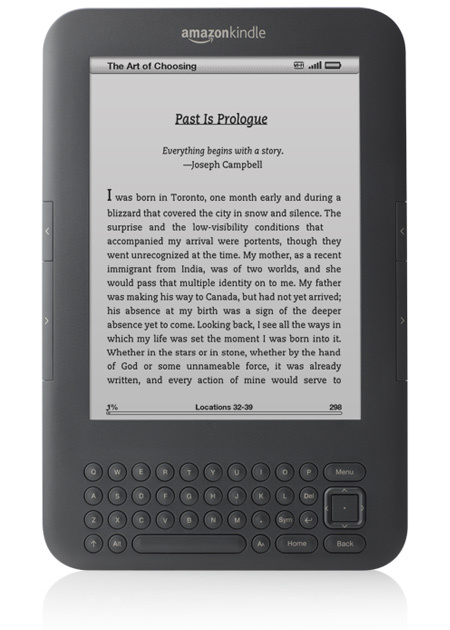 Send web articles straight to your Kindle – Kindlebility is a website that’ll help with that. Search engine for free Kindle books – Unfortunately, EU users don’t get a lot of free books, so any help in locating them is very welcome. Calibre – This free software is a very powerful tool for organizing your library, pushing books from your computer to your device and most importantly for converting any other ebook format to the Kindle friendly mobi or prc format. I really can’t sing the praises of my Kindle high enough. I do have to mention one thing though. The battery life of one month will only happen if you actually turn wifi off. If you leave wifi on, your battery will be drained in no time. Wish the manual had mentioned that anywhere. Got any other Kindle lovestories or cool things you do with it. Or any reason why you won’t get one? But like you said, I’ve read more in the last couple of months than I have in a long time all thanks to the Kindle. It’s great when on holiday, because I can bring lots and lots of books without using up all my luggage allowance and for commuting it is great as well. I am currently working my way through a series of fantasy books that even in paperback are very heavy – Kindle is a lot more transportable. I wasn’t sure of the concept myself before I got it. Big library fan here. There’s nothing more fun than spend hours at the local bookshops browsing shelves. But yeah. I just read so much more often now. I work tech support, have lots of downtime, and then I read. I don’t own one yet because I can’t afford one, and I still am not entirely sure if for me it will be worth it. I’d still buy a lot of books, and I’m not convinced it would save me enough money especially considering I get a lot of books second hand. That being said, I would love one, and have starred this post for later perusal – those links look very useful! It’s less about saving money for me than the convenience of being able to read, anywhere, anytime. I just read more. I am reading books right now that I have on my bookshelf, but I read them on the Kindle. I think anyone who loves to read will be able to take advantage of it somehow. Oh definitely. I do plan to get one, but I definitely don’t have £111 to spare (imagine I can do without 3G and not sure I fancy the new, cheaper, adverted one). I don’t think I’d benefit from the being able to read anywhere thing, but it would be fantastic for my dwindling shelf space! Wow… I don’t know much about the market for that type of books, but seriously? They cut up the books? That’s horrible. Especially considering that, overall, the German market is actually pretty good when it comes to translations. I prefer originals as long as I can read them too, but overall, our translation industry is large, fast, and of pretty high quality, compared to a lot of other countries. Seriously. Go to amazon.de, search for Rad der Zeit, find 33 books. Or the ‘A Song of Fire and Ice’, four books in English, 8 in German. Not as extreme as the Wheel of Time ratio, but still. The quality of the translations is good, but I just don’t agree with splitting books up like that. I’m sure that one of these days I’m going to break down and order the Kindle. My mom (who works at Barnes & Noble) gave me a Nook. I love it and was so excited about it until I brought it back to France and realized that B&N won’t let you purchase books outside of the US. Grr! So I end up buying Kindle books anyway to read on the iPad. But I miss the e-ink. I’m going to have to join a support group for gadget addicts at this rate. Amazon.de just opened their German Kindle store. I don’t know how big their French customer base is, but maybe the French Kindle store will soon follow. I have had absolutely no complaints with mine, it shipped super-fast from the US and buying and reading books is such a joy. Gadget addicts unite! Though I still don’t have any of the Apple stuff.